When you've just been through the wringer after a day of mountains and wind, what's the only thing that can revive you? Good old fish and chips, of course! Morton's is a proper seaside chippy that beckoned to us when we hobbled into town around 3 PM. We drew many a curious glance as we stood in line with our chapped cheeks and shivering lycra-clad selves, drawing in deep breaths at the glorious smells emanating from the giant fryer. Two takeaway packets of crispy cod and fat chips later, we were sitting by the beach eating our faces off in silence. We didn't care that it was freezing and blowing a hurricane. We earned this, and nothing was going to stop us. We also met a few interested folks who were curious about our tandem, and are increasingly learning that such a bike is a rarity amongst these parts. This was outstanding fish and chips, and Jess couldn't have chosen a better place to break her duck (cricketing terminology for scoring your first run). Neil has had rather a lot more fish suppers in his time, but he reckoned it was as good as it gets. Highly recommended if you're passing through. With full and happy bellies, we proceeded to undertake one final climb up to our bed and breakfast. The most direct route was to go up North Road from the shore, but that meant climbing a nasty-looking hill that we estimated at around 15%, and we just didn't have the mental or physical strength for that any more. So we took a longer route which circumvented the worst of it but still included a not-inconsiderable climb which drained the last reserves of our fuel tanks. Worst of all, the wind had got even worse, and it was all Neil could do to steer us in a straight line on a busy road. Finally, we arrived at our establishment for the evening: J and J Bed and Breakfast. If you look to the left, that's the plateau of the nasty hill we avoided. And even that's still steep! Upon arrival, we were greeted by Jennifer, the friendly owner who directed us to her sunroom where we could store the bike overnight to keep it out of the wind, which had begun flinging dirt and grime off the ground at us. Once safely inside, we stood in the foyer for a moment to catch our breath, with Jennifer fluttering around us like our long lost granny. "You poor things. Your room's just upstairs, follow me." She led us to a small, cozy en-suite room with a double bed, TV, and all the throw pillows we could want, all the while proudly proclaiming that our bathroom had one of those newfangled "power showers". As Northern Ireland's water supply is quite low pressured, this was a bit of a treat. For us, anything that will wash off the day's blood, sweat, and tears is good enough, and we were grateful just for a warm place to rest. £30 per person per night also got you a full Ulster fry in the morning. Dead on. After a wee lie down, during which we thoroughly enjoyed the Paralympics which were broadcasting live on the television, we decided to brave the gales outside and go for a walk down the beach. There's only one word to describe Northern Ireland when it's like this and that's "moody". Random twilight motorcade up North Road. 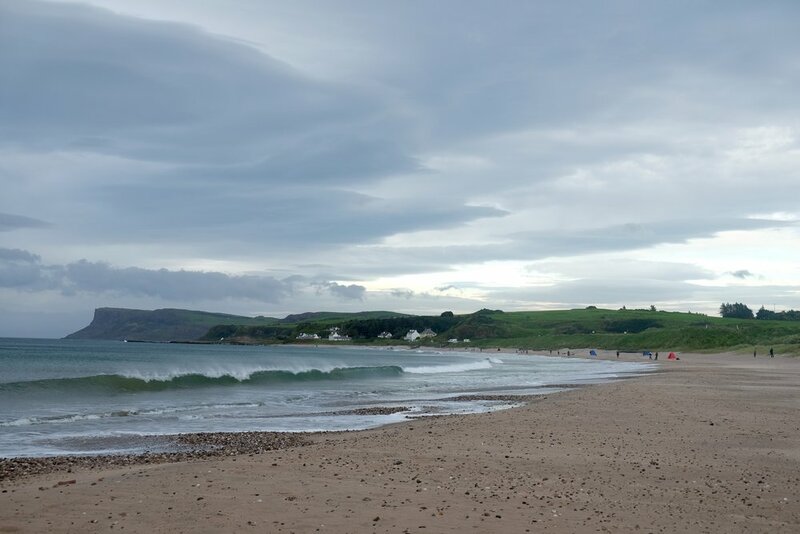 Ballycastle sits in-between Glenshesk and Glentaisie, which explains its hilly landscape, and is a great starting off point for exploring nearby attractions on the Causeway Coast. It's a wee seaside town that originally made its money in industry, producing coal, iron, soap, bleach, salt, and glass works. Nowadays, it's a popular hangout place for the locals during summer weekends. Neil: "Shut yer bake**, it's warm and sunny." The town's biggest claim to fame is Guglielmo Marconi, the inventor of wireless telegraphy, who made his first successful radio transmission between Ballycastle and Rathlin in 1898. There's a memorial on the seafront which we bypassed because we were in grave danger of being blown over. Plus, we were starving. The Central Bar on Ann Street called our name due to its advertisement of live music later that evening. They also had several local beers on tap, and one that we particularly enjoyed was the Rathlin Red. The small scale of this brewing operation became apparent when we asked for a second round and was told that "The boy who makes it ran out. Sorry." As we ate our dinner, a man with his guitar and his companion on the fiddle regaled us with nostalgic tunes of old times past. The room slowly filled with more and more old people and before we knew it, the entire place was singing along merrily. There was a golden age couple in the corner that we couldn't stop watching all evening, one: because the husband was English yet knew the words to every song, and two: because his wife fell asleep but was so still that at first, we thought she was dead. It was a lovely ending to a long day. *"Foundered" - Norn Iron spake for "feckin freezing". **"Shut yer bake" - a loving term when you want your significant other to be quiet.